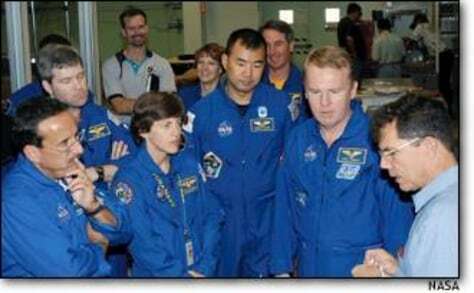 Wearing blue flight suits, astronauts listen to manager Jeff Andress. From left are Charles Camarda, Stephen Frick, Wendy Lawrence, Eileen Collins, Soichi Noguchi, Stephen Robinson and Andrew Thomas. All but Frick are to fly on STS-114, along with James Kelly (not pictured).